Landed properties are houses with gardens. Conventional landed housed comprises of bungalows (a freestanding house), semi-detached (a pair of houses) and terrace units (a row of houses), all of which come with private garden compounds or garage. BUNGALOW - Bungalow. Free standing house with no shared wall with others except the fence. DETACHED - Detached House. Same as Bungalow, with no shared wall. HOUSE - House. May be any form of house listed here. SEMI-D - Semi Detached House. A pair of houses, two houses joint side by side. TERRACE - Terrace House. A row of houses joint side by side, may be corner or intermediate terrace. 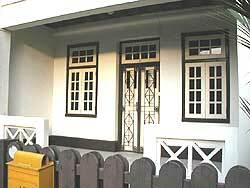 These types of houses below are either conservation shophouses or colonial houses and bungalows. A good example will be shophomes like Townerville. Kindly contact us if you are interested in them. COLONIAL HOUSE, BUNGALOW - Houses built in the pre-war British colonial times. CONSERVATION HOUSE, SHOP HOUSE - Houses or Shop Houses that are marked for conservation. BLACK AND WHITE HOUSE - Houses built in the pre-war British colonial times, with white & black exterior..
HERITAGE HOUSE - House constructed with a touch of Asian heritage and culture, Balinese concept.